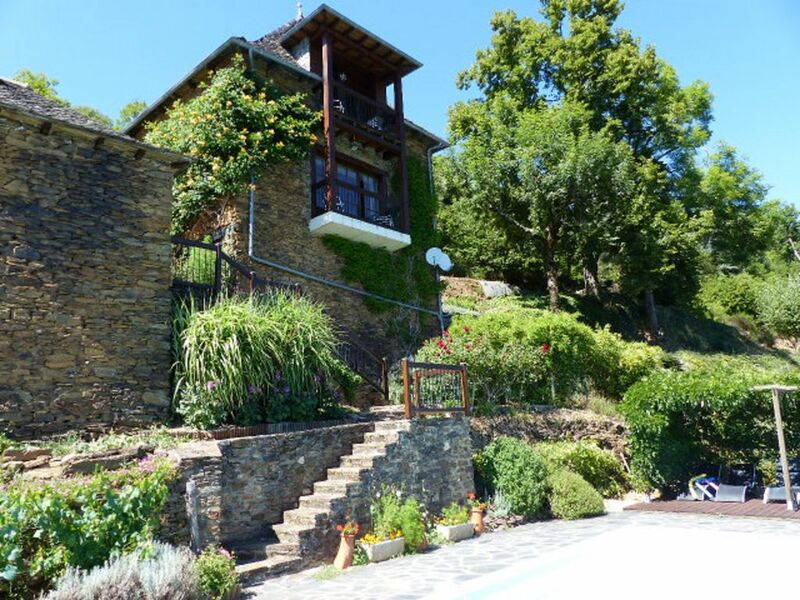 Delightful converted barn situated on a quiet hillside in the 'Vallee du Lot', Aveyron, South Western France, with far reaching uninterrupted views of the surrounding landscape. Originally an old farm dating from 17th century with new additions added in 1857. It has been lovingly restored using only local skilled artisans and now provides high quality holiday accommodation in a unique and picturesque setting. The Grange at La Margoy provides comfortable accommodation for 6 people. It has 3 large bedrooms. The master bedroom has en suite facilities and a balcony giving uninterrupted views for miles. There are 2 other bedrooms, 1 double and 1 with 2 single beds, plus there is a large family bathroom with bath and shower attachment. Downstairs there is a modern kitchen leading to a large comfortable sitting/dining room with a balcony giving marvellous views down the valley. The kitchen is fully equipped as you would expect with gas hob,electric oven plus dishwasher and fridge freezer. There is also a washing machine and dryer in the bouanderie.The house is centrally heated and has a wood-burning stove for the cooler nights. The property is situated approximately 5 miles from the towns of Entraygues (to the south) and Montsalvy (to the north). Both towns are easy to get to and have banks, butchers, bakers and small convenience stores for everyday purchases as well as a plentiful supply of cafes and restaurants. Each town has its own market. Please note no discos-if you want rock and roll nightlife you are in the wrong place. If however you want to relax in the tranquility of this unspoilt region of France this is the holiday for you. All towels are provided but you will need to bring your own swimming towels. Wi fi is available but occaisionally signal is weak as we are 7kms from central unit. This is most most wonderfully maintained and well equipped gite we have ever stayed in. There was nothing missing. The house, grounds and pool are extremely comfortable and immaculately maintained by the gracious owners. The setting and the views are absolutely stunning. It's a shame we can't give this property 6 stars. An extremely relaxing two weeks in the most well-equipped Gite we have stayed in. Unobtrusive owners nearby, a beautiful pool and terrace and captivating views across the Lot Valley, especially early mornings with mist evaporating. hot days but cool nights - a perfect place. David and Selena are the most gracious hosts and will leave you alone if you wish or socialise as is your wont. The house is supremely well appointed and the views are fantastic. The rooms are clean and spacious with god comfortable furniture.The pool is very convenient, the facilities are excellent. The nearby towns/villages of Entraygues, Le Fel and Veiellevie are charming with good bars and restaurants. Further afield the bigger towns of Aurillac and Rodez offer good shopping opportunities. All in all excellent value, thoroughly recommended. This is the best place we have stayed in France. The house is situated in a quiet area of rural France. It is well equipped and comfortable for 6 people. There is a fantastic pool and this also overlooks the outstanding views of the valley. There are numerous terraces to soak up the sun, relax and watch the hunting birds float on the thermals. The house is close to many local marked walking routes if you are so inclined and great restaurants are close too. A great place to stay. We stayed for 3 weeks in June 2014 and going back in 2015. Excellent value. fantastic location with stupendous views, very well appointed, convenient pool with shade if needed, charming owners living in adjacent lodge, good walks and cycle rides, easy driving distance from many interesting restaurants and eateries. Area provides spectacular scenery and enjoys its own climate which is almost Mediterranean in nature. There is an abundance of forest in the 'valley' which provides home to a great variety of bird and wildlife including deer, wild boar, red squirrels, and pine martins. Because of its situation there are excellent walks and cycle rides on marked routes from the front door of the grange, if you feel so inclined.Horse riding is also possible from a local stable. In the winter there is skiing at Le Lioran in the Auvergne approx 1 hour away. Also for cross country skiers there is the Aubrac also 1 hour away. Alternatively you can sit by the pool and watch the red and black kites and buzzards float on the thermals over the valley. If you are lucky you will get a glimpse of our local eagle on his hunting expeditions. Plenty of outdoor activities are available locally too. One of the most popular is taking a canoe or kayak down the Lot river for 10kms or more.